Born in India in 1923, Terry Walker attended boarding school in Calcutta until he was 12 years old. Terry has fond memories of this time playing hockey regularly and also enjoying a game or two of soccer. At 14 years Terry and his 15 year old brother, Cecil, set sail to England to live with their mother. The journey was an exciting “boys’ own adventure” for the two unaccompanied young lads. Terry recalls his dismay on disembarking when the ship’s steward ran after them demanding a ‘tip’ (a practice the boys were not aware of). Terry immediately enlisted in the Royal Army Service Corps where, initially, he played base trombone in the Army Band. Terry also served in Wales where he trained American soldiers in secret tank manoeuvres in preparation for their service in France during WWII. Towards the end of his Army days, Terry worked as supervisor of an Officer’s Mess catering to the Generals of the day. As there were no married quarters on the Base, Terry left the Army to marry his beloved Doris and start a family. Terry found employment within the car assembly division of the Ford Motor Company. Always the adventurer and with dreams of sunny Queensland, Terry and his family immigrated to Australia in 1957. The six week-long voyage aboard Fairsky was an exciting adventure for the family. The ship initially docked in Perth, where they declined an invitation to stay. Terry was determined to settle in Queensland so they eventually disembarked in Sydney. A long train journey to Brisbane followed where Terry and Doris were given a choice; stay in Brisbane in temporary quarters or travel further north to the seaside resort of Redcliffe. Fortunately, they chose the second option. Within three months of arriving, Terry purchased a block of land at Clontarf and commenced building the home in which he still lives today. In 1960, Terry began working in the laundry department of the Royal Brisbane Hospital and was promoted to Manager for the last ten years of his service. At that time, the Clontarf Beach Progress Association was formed to address local concerns and provide support for local residents and community groups. Terry and Doris spent many hours volunteering their time within the Association. Notably, Terry worked with other volunteer Association members and tradesmen to build the Clontarf Community Hall in Cornelius Street, Clontarf. Many community groups and individuals still benefit today from use of this hall. Back in the late 1960s, Terry along with other volunteers began to transform a cow paddock at Redcliffe into what is now the Redcliffe Botanic Gardens. Today the gardens exhibit a large variety of native Australian plants and provide a peaceful setting for picnics and other gatherings. Terry has always had a passion for fossicking and the cutting and polishing of stones and gems. 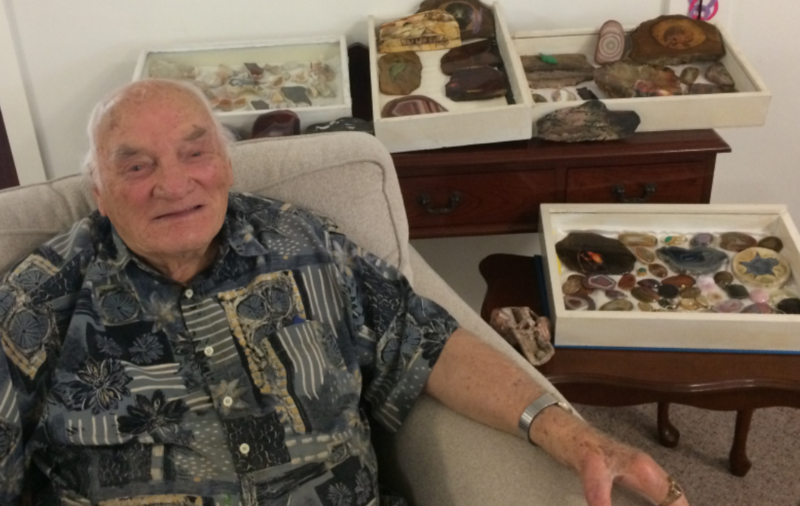 He was President of the Redcliffe Peninsula Lapidary Club for many years. Former Redcliffe Mayor, Ray Frawley, opened the ‘Terry Walker Room’ at the Redcliffe Cultural Centre in recognition of Terry’s countless hours of volunteering within the Redcliffe Community. Now 93 years, Terry still enjoys fossicking with his trusty shovel, attending weekly Lapidary workshops and spending time with his family. Terry is a highly respected member of the “Invigorate” family. His happy, positive personality and willingness to share his knowledge and passion for Lapidary are appreciated by many people.